Description of course: Introduction to scientific principles of soil fertility and crop production and protection by organic procedures. Topics include definition and certification of organic products; techniques of organic agriculture (including companion planting and intercropping), organic farming and gardening systems and approaches (including Biodynamic farming and forest gardening); the ornamental organic garden; organic soil stewardship; organic management of weeds, insects and diseases; organic organizations and some important figures in organic farming and gardening. Students in this course will study materials (texts, articles, videos, blogs…) provided in course units, which are placed into weekly activities. Quizzes will be taken on each of the activities as students progress through the course. In addition, students will study subjects that are related to organic farming and gardening. Assignments on these topics include writing of four essays on subjects that the students choose from a list. Textbook: Barker, Allen V. 2010. 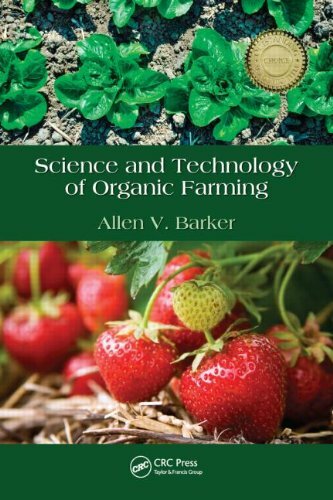 Science and Technology of Organic Farming. CRC Press, Boca Raton, Fla. Readings and learning: For each unit, the appropriate textbook chapter to be read, videos and blogs to study are noted. Quizzes (assessments) will be based on the readings in the textbook and other material in the unit. Reading for the essays (assignments) are suggested from the Internet and from the Reading folder. Students may choose to consult other readings for preparation of the essays. Assessments: Assessments are quizzes based on the contents of texts and material of topics noted in the Description of course. Students are expected to study the units’ materials and to complete the quizzes slightly more often than once a week (The summer session is about 10 weeks long, and there are 15 quizzes). Quizzes have specific due dates and must be completed by the due date. Assessments are 15 quizzes on topics that are included in the folder of Course Units. No final examination is given for the course. Each quiz is worth 4% of the final grade. Topics are identified by subject matter and by unit of the course. Quizzes may be taken anytime during the course but must be completed by the end of the semester or summer session. Units include the following topics. Assignments: Outside reading is required for completing written assignments. Some suggested texts are included in a folder entitled Reading. These texts contain general information related to organic farming and gardening. Internet materials are given in a folder of Internet Links and under Web Links in the Course Content sidebar. The Internet Links address general topics, and the Web Links relate directly to the subjects of Assignments. Assignments will be to write essays on four subjects chosen from a list, which is presented below under Assignments. Instructions for writing the essays are presented in this syllabus and also on-line in Assignments under Course Content. Four essays are required. Each essay is worth 9% of the final grade. Subjects for the essays must be chosen from the following list. Essays need not be completed and presented in the order listed, but time limits for presenting the first, second, third, and fourth essays will be defined. These limits are given in Assignments under the Course Content sidebar. Status of current knowledge of the topic in relation to organic farming and gardening. Papers should expand the writer’s knowledge of the topic. Allowing the writer to gain an understanding of the topic beyond everyday knowledge. Allowing the writer to develop an informed position on the topic. The paper should be 3-to-5 pages long. Use as a guideline for preparation: 8.5″ x 11″ paper, 12-point, double spacing, and 1-inch margins. Discussions: Several topics of discussion are included in the course. Students should participate at least once in each of the discussion topics that are mentioned. About the instructor: Dr. Allen V. Barker is a professor of plant and soils sciences in the Stockbridge School of Agriculture. He teaches courses in organic farming, soil fertility, and plant nutrition. He studies the nutrition of horticultural and agronomic crops in research directed toward improving the nutrient-use efficiency and productivity of crops and accumulation of nutrients in vegetables.